Denny Hamlin piloted the No. 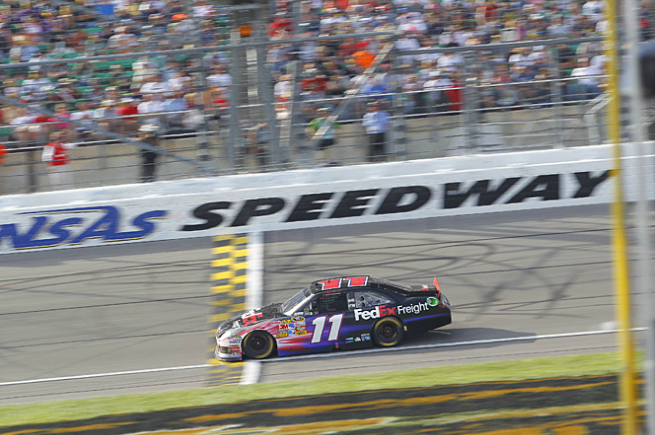 11 FedEx Freight Toyota to a 16th place finish in the Hollywood Casino 400 at Kansas Speedway on Sunday. 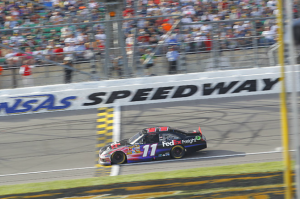 With the result, Hamlin remains 12th in the points standings with six races remaining before the 2011 NASCAR Sprint Cup Series champion is crowned. Jimmie Johnson held off Kasey Kahne to claim the checkered flag. Brad Keselowski, Matt Kenseth and Carl Edwards rounded out the top five finishers. Hamlin’s Joe Gibbs Racing teammates Kyle Busch and Joey Logano finished 11th and 29th, respectively. The FedEx team started the day on the inside of row four after posting a strong qualifying run on Friday. Handling issues began to plague the FedEx car almost immediately after the start. The car was fighting Hamlin into and out of the turns, and the team dropped to 11th place by the first pit stop on lap 21. The second pit stop of the day came under green flag racing on lap 66, bringing a welcome opportunity for a wedge adjustment to help correct the handling problems. Another wedge adjustment came on lap 85 as the field pitted under caution. By lap 117 of 267, the No. 11 car’s handling problems appeared to grow worse, with Hamlin remarking over the radio that the car only has about 60 percent of the grip it had to start the day. Despite the loose race car, the team was still running just outside of the top ten. A green flag pit stop on lap 172 finally paid off for the FedEx team. The team made another wedge adjustment that seemed to improve the car’s handling with Hamlin in 12th place. With the handling issues in better shape, the FedEx team turned its sights to pushing the car up to the front. A caution flag on lap 205 brought the field to the pit stalls. The team added tape to the grill to help speed up lap times, in addition to four tires and fuel. When the green flag dropped with 57 laps remaining, Hamlin was in 10th place.